The movie “Casablanca” was released in January of 1943, timed to coincide with the Casablanca Conference, the high-level meeting between Roosevelt and Churchill. The film wasn’t a box-office hit, but gained critical acclaim, winning three Oscars including Best Picture. The signature song “As Time Goes By” was written many years earlier for a 1931 Broadway musical called “Everybody’s Welcome”, and was a hit in 1931 for Rudy Vallee. But today we all remember the Casablanca version, sung by Dooley Wilson (who played “Sam” in the film). Poor Dooley didn’t get to record it as a single, due to a musician’s strike in 1943. The 1931 Rudy Vallee version was re-released that year and became an even bigger hit second time round. Ione Skye is an American actress born in Hertfordshire in England. She is best known for portraying the character Diane Court in the 1989 high school romance movie “Say Anything…”, starring opposite John Cusack. Skye is the daughter of the Scottish folk singer Donovan. Loam is soil made up of sand, silt and clay in the ratio of about 40-40-20. Relative to other soil types, loam is is usually rich in nutrients and moisture, drains well and is easy to till. Loam can also be used in constructing houses as it is quite strong when mixed with straw and dried. A horde is a large crowd. “Horde” ultimately derives from the Turkish “ordu” meaning “camp, army”. A vicinity is an area surrounding a place. The term “vicinity” ultimately comes from the Latin “vicus” meaning “group of houses, village”. “Espagnol” is Spanish for “Spanish”. Spain is the second largest country in the European Union (after France). “Spain” is an anglicized form of the Spanish name “España”, which comes from the Roman name for the Iberian Peninsula “Hispania”. “Folsom Prison Blues” is a song written and recorded by Johnny Cash. Cash wrote it in West Germany while serving in the US Air Force after seeing the movie “Inside the Walls of Folsom Prison”. An iconic (and scary) line in the song is “But I shot a man in Reno, just to watch him die”. The Matchbox brand of toy cars were introduced in 1953, and how I loved them growing up. They were called Matchbox cars because they were packed in boxes that looked liked regular matchboxes. The brand was English, but the name spread around the world. The brand was so popular that the term “matchbox car” came to mean any small, die-cast toy car, regardless of who made it. The Parker Pen Company was founded in 1888 in Janesville, Wisconsin by George Safford Parker. Parker had repaired and sold fountain pens as a sideline for many years. With this experience, he created pens that were less likely to leak ink and founded his company based on these patented designs. Octopodes and squid have the ability to release a dark pigment into the water as a means of escape. The dark pigment is called cephalopod ink (the squid and octopus belong to the class cephalopoda). The dark color is created by melanin, the same substance that acts as a pigment in human skin. “Privy” is slang for an outhouse or toilet, and is a term that presumably comes from “private”. The word “lummox” comes from East Anglian slang , and describes an ungainly and often clueless person. The term is probably a contraction of “lumbering ox”. Dolmas are stuffed vegetable dishes from the Middle East. Strictly speaking, dolmas are made by hollowing out some vegetable before adding a stuffing. The derivative dish called “sarma” is made by wrapping vine or cabbage leaves around a filling. In many cuisines, the name “sarma” has been dropped in favor of “dolma”. In Spanish, “el año” (the year) starts in “enero” (January) and ends in “diciembre” (December). The Koran is also known as the “Qur’an” and “Quran” in English. “Qur’an” a transliteration of the Arabic name for the holy text of the Muslim faith. The literal translation of “Koran” is “the recitation”. “Noob” is a not-so-nice slang term for a “newbie”, and often refers to someone who is new to an online community. Liam O’Flaherty was novelist and political activist from Ireland. For what it’s worth, I was a classmate of Liam’s daughter Joyce when I was at university in Dublin. As always seems to be the case with Greek gods, Eros and Aphrodite have overlapping spheres of influence. Aphrodite was the goddess of love between a man and a woman, and Eros was the god who stirred the passions of the male. The Roman equivalent of Aphrodite was Venus, and the equivalent of Eros was Cupid. The clarinet is a lovely-sounding instrument, isn’t it? The name “clarinet” comes from the Italian word “clarino” meaning “trumpet”, with the “-et” suffix indicating “small”. The museum known as “the Tate” is actually made up of four separate galleries in England. The original Tate gallery was founded by Sir Henry Tate as the National Gallery of British Art. It is located on Millbank in London, on the site of the old Millbank Prison, and is now called Tate Britain. There is also the Tate Liverpool in the north of England located in an old warehouse, and the Tate St. Ives in the west country located in an old gas works. My favorite of the Tate galleries is the Tate Modern which lies on the banks of the Thames in London. It’s a beautiful building, a converted power station that you have to see to believe. John Constable is the most English of painters, although during his lifetime his work was more popular in France than it was in his native country. His most famous painting is “The Hay Wain” from 1821, which you can see in the National Gallery in London. John Singer Sargent was an American artist best known for his portrait painting. Sargent trained as an artist mainly in Paris, although he found that he had to leave the city after one of his paintings was deemed “scandalous” by French society. The work was “Portrait of Madame X” (1884), a painting of a noted lady in society that was considered too risque and sensual. After the painting was exhibited, his commissions dried up and Sargent moved to London in order to continue his career. Today the “Portrait of Madame X” is considered by many to be Sargent’s best work. The Sith are characters in the “Star Wars” universe who use the “dark side” of “the Force”, and as such are the antithesis of the Jedi Knights. Members of the Sith use the title “Darth” before their name, as in Darth Vader. The last made of the six “Star Wars” movies is called “Star Wars Episode III: Revenge of the Sith”. Oxeyes are in the daisy family of plants. A blouse is a loose-fitting shirt, particularly one worn by women or children. The term “blouse” is French, and originally described a peasant’s smock. 63 “Listen here!” : HEY! IIRC, before Tyco cheapened them down, Matchbox cars were made my Lesney, which unfortunately didn’t fit….not even close…. 16 minutes but I fudged. 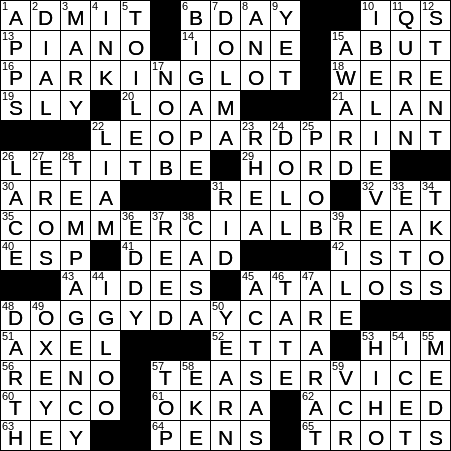 Looked over the clues for gimmees before I started. Then dove in with pen. Tuesdays are rarely pencil worthy. Had a small problem at 57A, couldn’t figure what a TEASER VICE was or how it related to spots. D’oh! @Bill—-Thanks for the comments on Johnny Cash. I am a big fan. Every time I listen to him sing “I Walk the Line” I await that last verse to see if he can hit that low E on the word “mine”. He not only does it but he does it with ease. Cash was blessed with a great voice and musical talent to go along with it. 9:03, 3 errors: I(K)S; AB(O)T; (K)(O)RAN. Last 2 days seem to be a step up in difficulty from the usual Monday/Tuesday grids. 7:09 no errors. TEASER VICE got me for a moment too! Got most of it done, but had NEWB instead of NOOB, so that ruined that area. Also EDGE instead of ABUT. I often get caught off guard with words that can be either a noun or a verb like BORDER. I had HOHO instead of HIHO. Almost changed it (didn’t care for eitber one), but also could not make sense of TEASER VICE. Actually liked the “spots” theme, including the spot of tea. Carelessly left the K in KURAN, not thinking of the IQ cross. 8:37, 2 rather dumb errors.